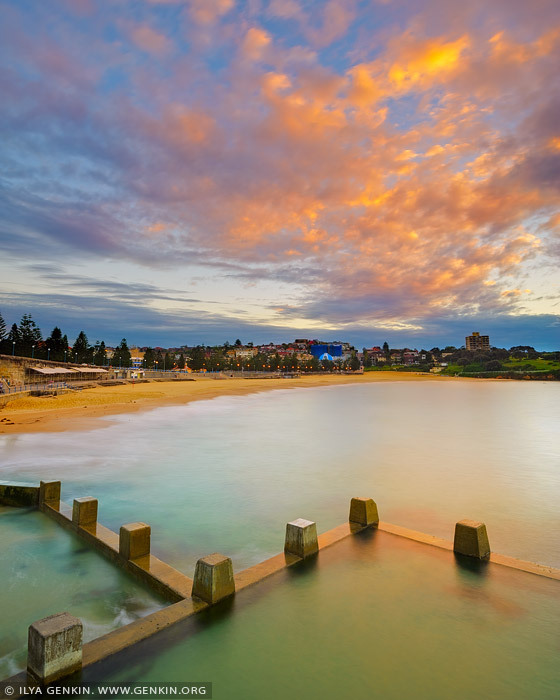 Coogee Beach is one of the best places to see sunrise in Sydney, NSW, Australia. With a shimmering beach, magnificent coastal walk and a protected Marine Reserve that attracts snorkellers and scuba divers, Coogee sums up the classic Sydney surf scene. It's a haven for families, couples and travellers alike. A diverse abundance of nearby cafes and restaurants will suit anyone's dining needs. This image belongs to the travel and nature stock photo library. This stock photo of Beautiful Sunrise Above Coogee Beach is available for licensing for commercial and editorial uses including websites, blogs, books, magazines, brochures and advertising. Restrictions may apply for images which contain third party copyrighted material or sensitive subjects. Photos of artwork are for editorial use only. This image id AU-COOGEE-BEACH-0003 of Beautiful Sunrise Above Coogee Beach, is copyrighted © by Ilya Genkin. This is not a public domain image.